While straightening out my pantry, I found a half bag of almond meal and recalled in that moment a recipe I had found on my Google+ feed. I went back to my feed to find her recipe and pulled it up. The image she shared was captivating but for personal reasons, I made some modifications to the list of ingredients. Go learn about the inspiration behind the sharing of her recipe on her blog, American Moments. Below you'll find the recipe adapted in several ways. Preheat oven to 375*. Line a cookie sheet with a parchment paper for easy clean up and even baking. Yields approximately 2 dozen 1 inch cookies. 1. 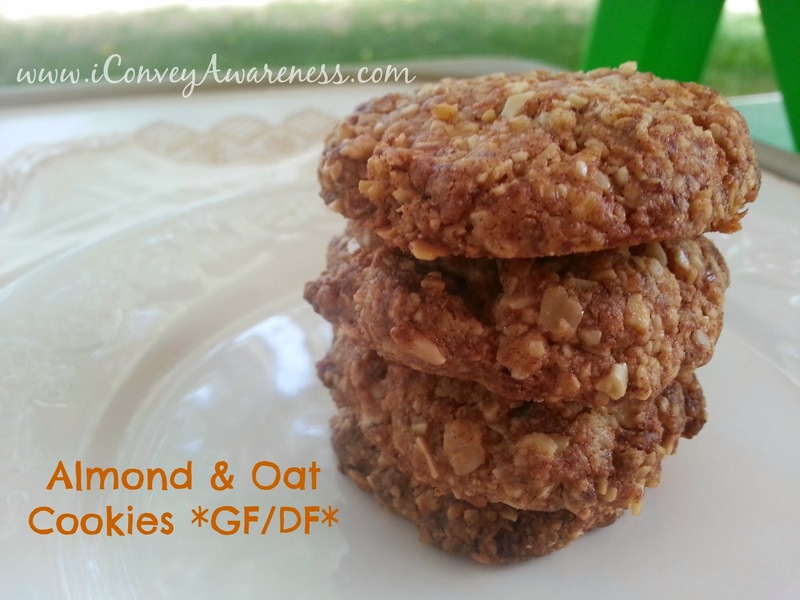 If you have almond meal on hand, pour it in a bowl with the GF flour, GF oats, baking powder, and salt. Mix. Note 1: If you do not have any almond meal on hand but you have whole or sliced almonds, you can go throw them in your high speed blender (like this) but use at least 1/2 cup at a time, minimum. Ground them until the texture you'll like. 2. In a separate small bowl, combine sugar, melted oil, and vanilla. Add this to the flour-oat-almond mixture. Note 2: If the mixture is too clumpy, add up to the 1 tbs of water. Mix. 3. You can eye it or use 1 heaping tablespoon of mixture and form into 2 dozen balls. Slightly flatten the balls with your first three fingers. Note 3: I later thought about using the back of a spoon to flatten the cookie balls so that I could add some dark chocolate to the center half way through baking. I may consider doing this on my next go-around. 4. Bake for 12-15 minutes. The mixture is already brown so if you see the edges darkening just a bit, it's time to take them out. If you smell roasted almonds, you'll want to take them out. They will taste fine but may be crunchier than normal. Cool for 10 minutes then store in an air tight container on your counter. These make a great pre or post workout snack, a quick breakfast item on the go, and an afternoon treat. I cannot pack these in my son's school lunch since it's a nut-free school zone but he enjoys them after school. I really enjoy the cookies. Since I didn't bake them with the dark chocolate, I may just dip the cookie in this (click here) chocolate hazelnut spread - and no, it's not the brand you're probably thinking. I was gifted a bag of almond meal and have never known what to do with it but I might start wiwth this recipe! We always need cookie recipe ideas. Oat and almond sounds very tasty! These do sound delicious. I'm not much of a morning eater, which I know is bad. I try to force myself to eat something before hitting the gym and this would be a great treat that I could eat on the car ride. What a healthy and delicious recipe! Thank you for sharing your Almond and Oat Cookies with us at the Healthy Happy Green and Natural Party! I am pinning and sharing!